I was recently asked to write about what is commonly referred to as a blow out kit. The term refers to an individual medical kit carried to treat immediately life threatening extremity hemorrhage, tension pneumothorax (collapsed lung), and airway obstruction. These three things are responsible for most traumatic battlefield deaths. While all have long been components of civilian emergency medical care, the civilian treatment for exsanguinating hemorrhage, as well as its priority in the sequence of care, has recently been evolving to match with the current military experience. Rather than discuss how to use the items in a blow out kit, I’m going to instead focus on the components that should be in the kit. More to the point, if you’re not sure how to use a specific item in a kit, I’m going to recommend that you seek out appropriate training, whether it’s a weekend class (such as the Dark Angel Medical class attended by Robert), Red Cross First Aid, or perhaps even an Emergency Medical Technician course. Such training is invaluable no matter your profession or lifestyle. There are any number of blow out kits or Individual First Aid Kits (IFAKs) that come already assembled and packaged from several vendors. For the average person, this is probably the best and easiest way to get a kit. Trying to assemble your own can be a more difficult and less efficient option than it may initially seem. The tendency to include more than what is necessary is hard to overcome and you may wind up with something that is not really a blow out kit, but more akin to a haphazard hodgepodge of trauma supplies. 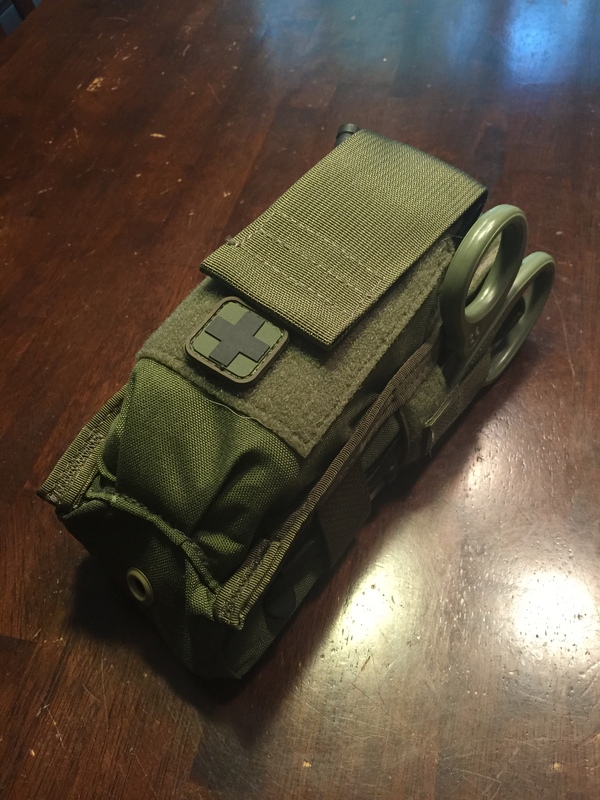 Dark Angel Medical, ITS Tactical, Cavalry Manufacturing, North American Rescue, Chinook Medical Gear, and many other manufacturers and vendors offer kits ranging from low profile options that will fit in a cargo pocket to more comprehensive kits designed to handle multiple traumatic scenarios. Do not be shocked by the cost of such kits. While expensive, much like your gun, when you need it, you REALLY need it. 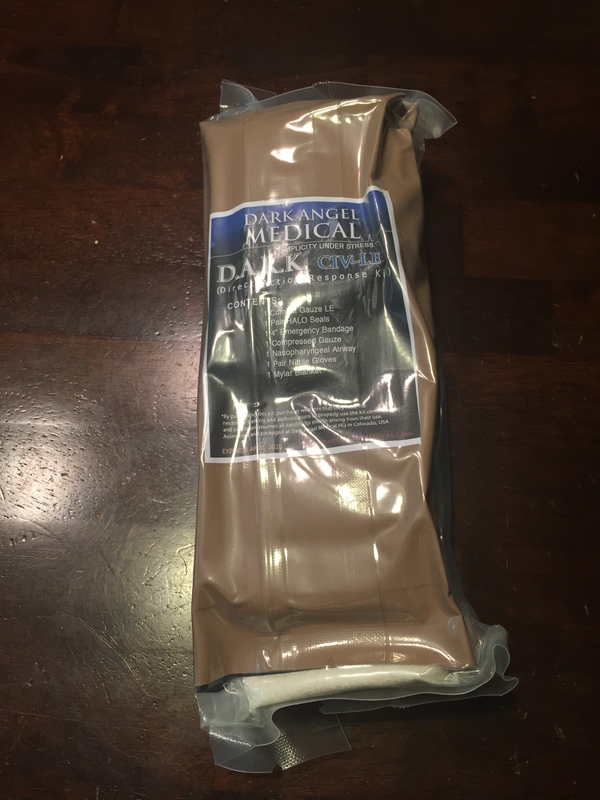 One excellent option that is ideal for range and training environments or perhaps car or bag carry is the Direct Action Response Kit from Dark Angel Medical. When purchasing, you can tailor your individual kit options to match your preferences and level of training. My own D.A.R.K. has been augmented with a chest decompression needle, but is otherwise the generic civilian kit. Regarding the available options, you should probably not carry items that you lack the training to use, both for legal as well as medical reasons. As to specific components, let’s start with hemorrhage control, as it takes precedence over other concerns in the modern paradigm of trauma care. The mainstays of bleeding control are pressure bandages, hemostatic gauze impregnated with clotting agents, and the tourniquet. 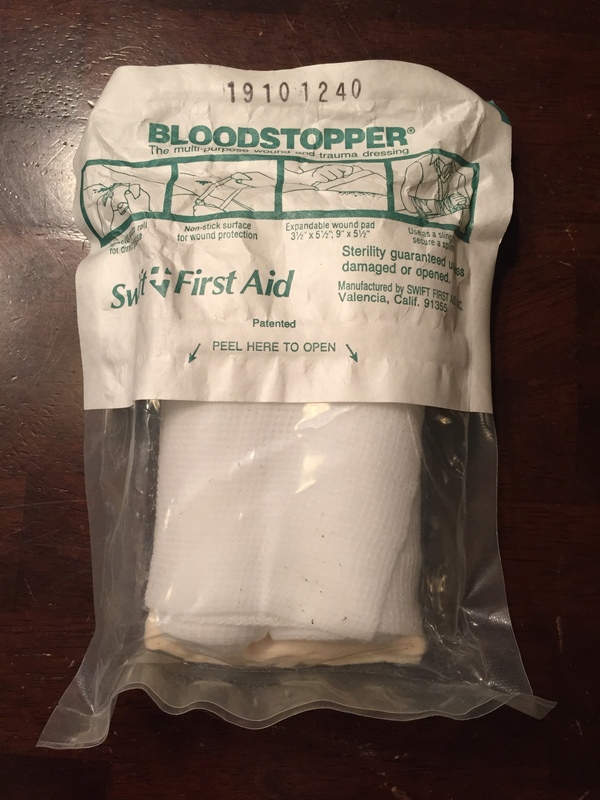 The ubiquitous pressure dressing included in many kits is the either the Israeli Bandage or a variation thereof, a multipurpose compression trauma dressing that has a decades long established track record of success and versatility. Many other analogues exist and serve just as well. Some common examples are the H&H Mini Compression Bandage, the OLAES Modular Bandage, and the H-Bandage. All accomplish the same goal of being a bandage that can both cover a wound and staunch bleeding through the application of direct pressure by means of a compression wrapping. Finally, the definitive and quickest way to control life threatening extremity hemorrhage is application of a tourniquet. 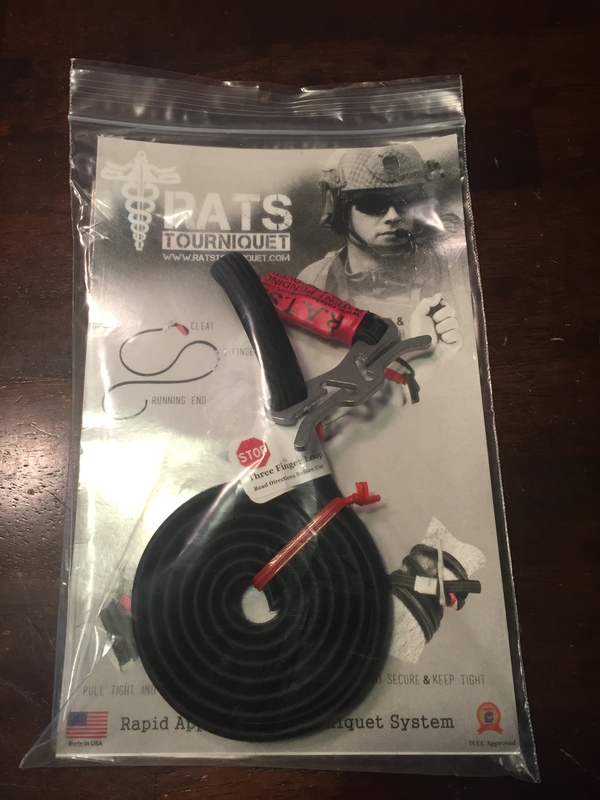 No longer considered a “last resort,” the tourniquet may indeed be the primary intervention immediately used to control life threatening extremity hemorrhage. I own and am familiar with three specific options. My favorite is the Special Operations Forces Tourniquet-Wide (SOFT-W) from Tactical Medical Solutions. I also really like the Combat Application Tourniquet (C-A-T), which is the tourniquet selected by my employer for use according to our trauma guidelines. While there is some controversy concerning its efficacy and endorsements, I also keep a few R.A.T.S. Tourniquets around as a low profile backup or for self-aid. They are inexpensive enough to keep one in each of my vehicles and in my range bag. After all, if you’re going to carry one tourniquet, then you should probably carry two. Most of us have four extremities and multiple victims are possible. Look no further than the 2013 Boston Marathon bombing for confirmation of this reality. Another low profile and inexpensive tourniquet is the Cavalry Medical Slick. While I have no direct experience with it, it is highly recommended by people I trust. Another good reason to carry either a R.A.T.S. or a Slick Tourniquet is if you are frequently around either children or K9s. Other tourniquets are often difficult if not impossible to sufficiently tighten around the extremity of a child or dog. While many of the low profile tourniquets on the market are realistically not as good as the gold standard example of a SOFT-W or C-A-T, they can be uniquely applicable in unique situations. There are two kit items to consider regarding the management of tension pneumothorax. The first is the chest seal, an adhesive and occlusive bandage designed to cover a “sucking chest wound” that left untreated, could potentially progress to tension pneumothorax. There are several different commercial seals available, and while nice to have, are not necessarily mandatory. I say this because quite frankly, an occlusive chest seal is easy to improvise from plastic packaging in your kit or even duct tape! 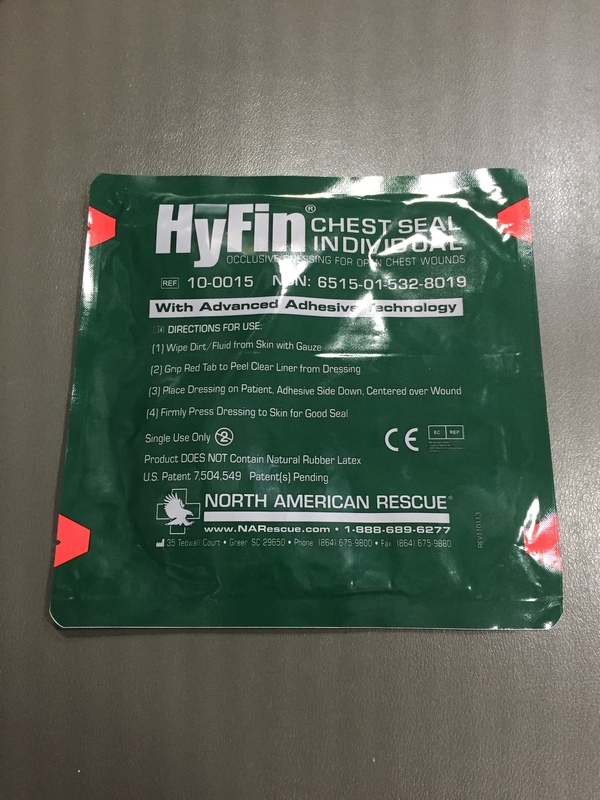 If you choose to include an occlusive chest seal, common examples are HALO Seals, the Foxseal, the HyFin Chest Seal, the Bolin Chest Seal, the Asherman Chest Seal, and simple and time proven Petrolatum gauze. The other item that is intended for management of tension pneumothorax is the chest decompression needle. However, unless you’ve received specific accredited training in needle decompression, I’m going to advise against including a needle in your kit. The only reason I carry one is because as a licensed paramedic, I am comfortable and experienced with the intervention. Again, tailor your kit to your level of training. I’ve trained with physicians that keep IV and surgical supplies in their range kit. But just because somebody else does doesn’t mean you should! If you’ve never stuck a needle in somebody, then immediately after a traumatic event probably isn’t a good time to start. Furthermore, tension pneumothorax generally takes time to develop and rarely requires immediate intervention in typical civilian emergency medicine time frames. The simple application of a chest seal as mentioned above can often mitigate the need for chest decompression in the field. Finally, we need to address airway obstruction. Most of the time, this is due to a patient being unable to maintain their own airway due to a decreased level of consciousness. Note that patients who have sustained significant facial or throat trauma can often maintain their airway if conscious and positioned correctly. 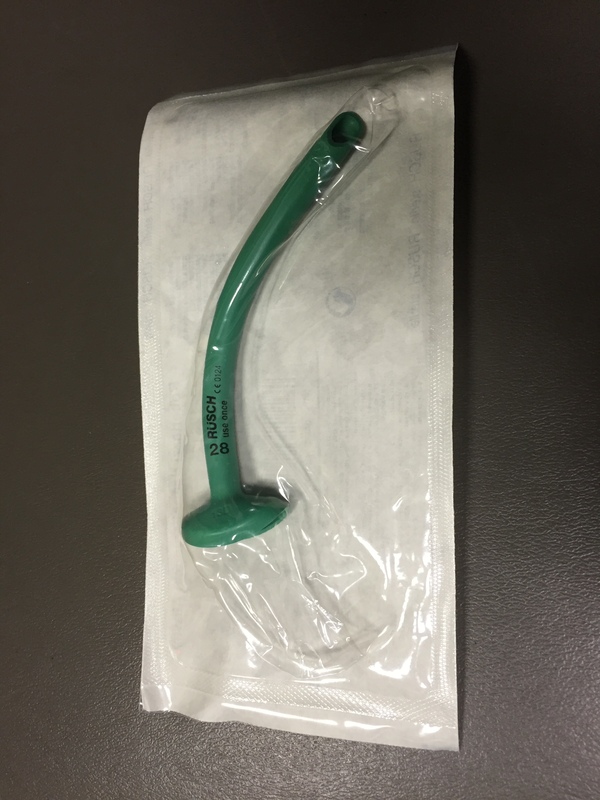 For those that can’t, one simple solution is an airway adjunct such as the nasopharyngeal airway often included in blow out kits. Basically, this tube is inserted in either the nostril or even the mouth to provide for an unimpeded airway. Again, seek training before you go shoving tubes into people’s faces. A 28 Fr Nasopharyngeal Airway…. Many kits will also include a Mylar blanket, since keeping a trauma victim warm is of the utmost importance to prevent the trauma triad of death. Some kits will also have trauma shears and almost all will include nitrile gloves. Invariably, these gloves will be of XL size to fit everybody. However, working in bloody conditions with gloves that are too big is not ideal, so I prefer to add a pair of the correct size gloves for my hands to my kits, keeping the ubiquitous XL gloves to give to impromptu bystander assistants. 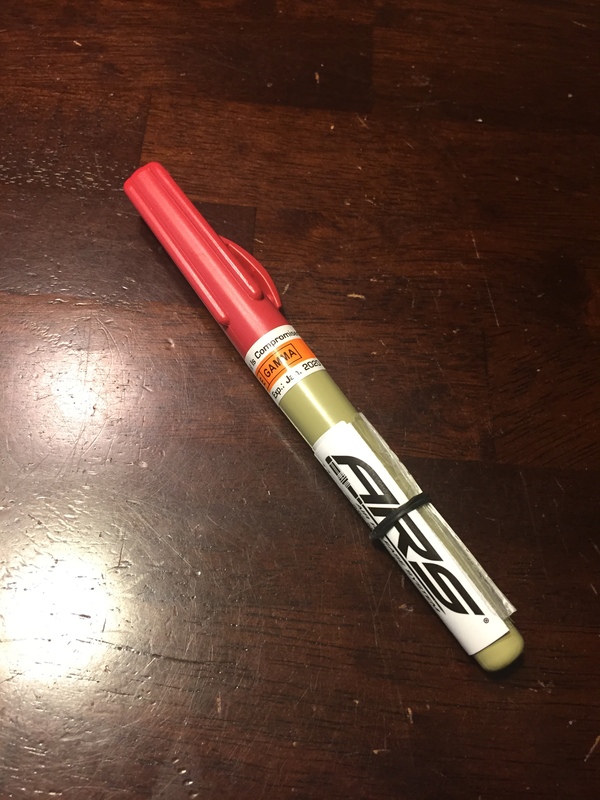 One last item to consider adding to a kit is a Sharpie marker. This addition allows you to mark the time of application of a tourniquet, as well as marking a patient accordingly or taking notes on almost any surface for continuity of care. 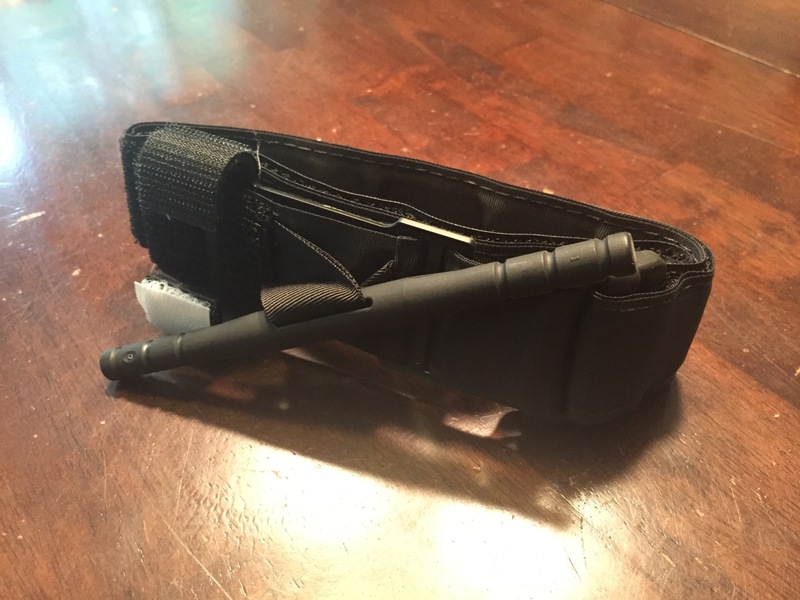 Blowout kits can be carried in a pouch on the belt or attached to webbing on duty gear. Most kits have their main contents vacuum packed in an insert that may fit into a spare magazine pouch on gear. The D.A.R.K. for instance, fits easily in a double magazine pouch. If you carry a gun for a living, then the tourniquet should be kept somewhere immediately accessible on your gear. 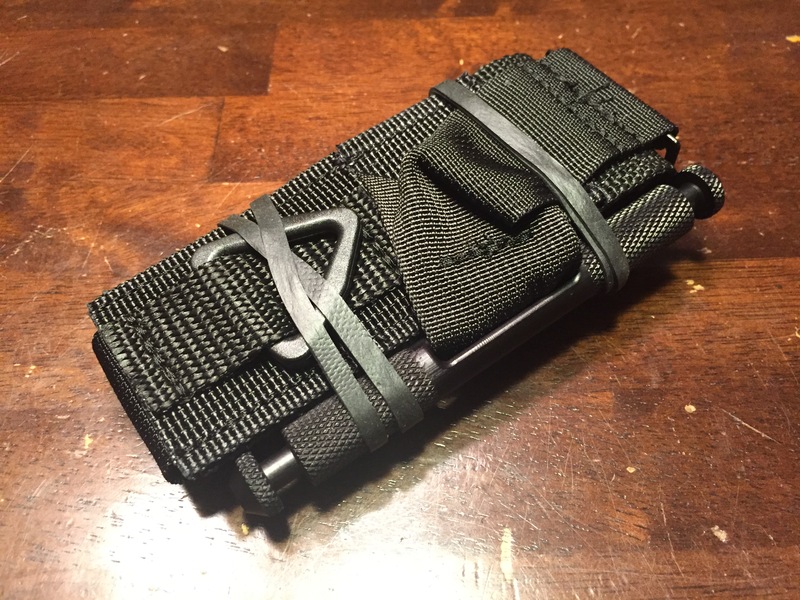 Blue Force Gear makes an excellent device specifically designed to hold a tourniquet on MOLLE webbing called the Tourniquet NOW! Strap. 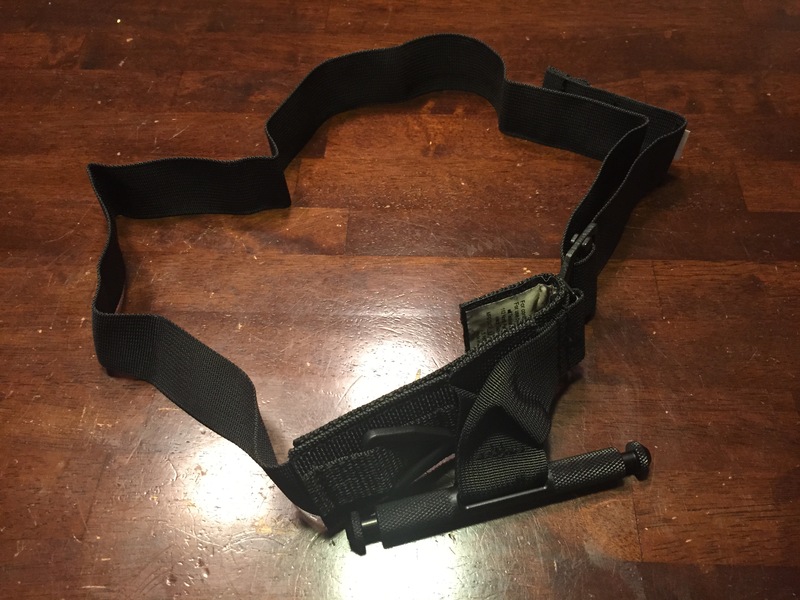 Other vendors offer a variety of belt or vest mounted pouches to hold a tourniquet. Most blow out kit pouches will have a provision specifically for keeping the tourniquet accessible. I have also seen others choose to band a tourniquet to their rifle stock. When training, I personally prefer a comprehensive blowout kit such as the DARK kept somewhere in or on my gear with a smaller minimalist kit carried in my right cargo pocket. Most of these minimalist kits focus on hemorrhage control, which is appropriate given its priority in the sequence of care. In my day to day life, I will confess that I often don’t carry much in the way of medical gear on my person. At most, I may have one of the minimalist kits described above in a cargo pocket. In my vehicle, on the other hand, I keep a Maxpedition sling pack that is appropriately stocked with supplies specific to my training and experience. In regards to DIY pocket kits, with a food vacuum sealer, you can come up with some quite compact kits that don’t take up much room. 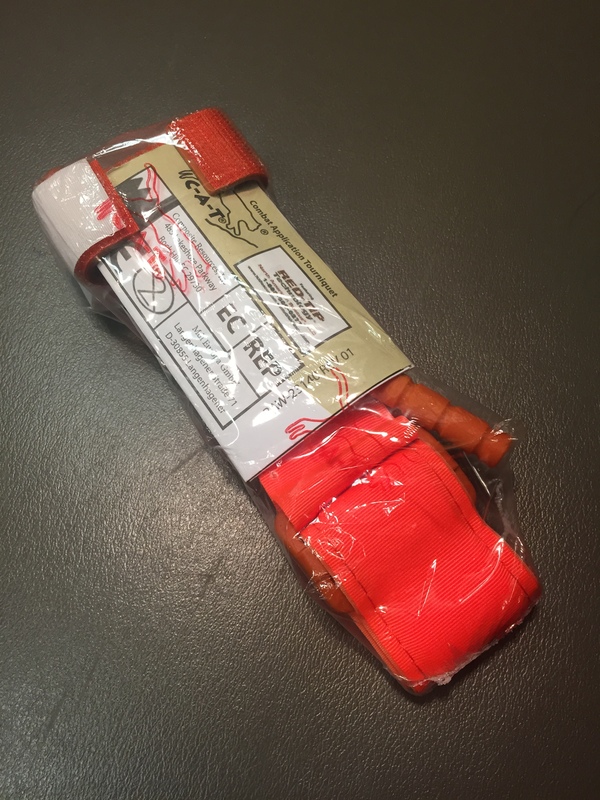 I hope this has been a useful review of individual trauma kits and I encourage our readers to seek out quality medical training and comment or post questions below. Posted in Medical, Training.Tagged Blow Out Kit, First Aid, IFAK, Tourniquet. Updated with a few added links and some new to me information!